The Nigerian Government had through the Minister of Information and Culture, Alhaji Lai Mohammed, said that France was the headquarters of IPOB’s funding. 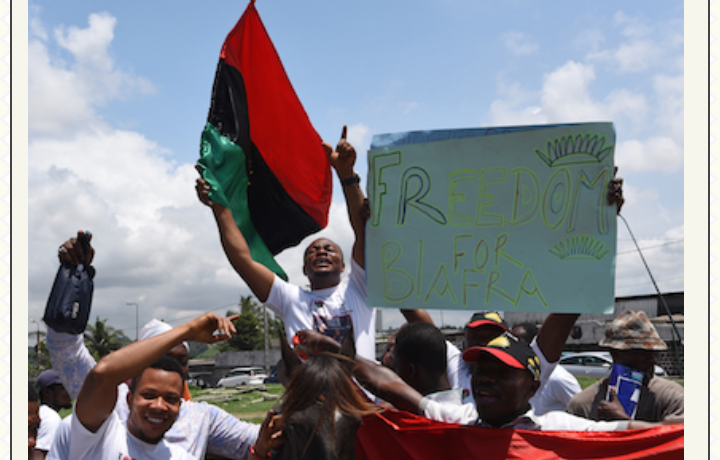 But the European country on Thursday said it had no knowledge of IPOB’s presence in France. But a very senior government official said the Federal Government had reached out to France, explaining that it did not accuse the country of being the sponsors of Biafra but that a large transfer of funds were made regularly from France to IPOB in Nigeria. It was learnt that the Federal Government had asked the Nigerian Financial Intelligence Unit and the Central Bank of Nigeria to compile the needed information on the sponsors and it hand it over to the French government. The government will also write the Special Control Unit against Money Laundering, which is tasked with the mandate of supervising, monitoring and regulating Designated Non-Financial Institutions as regards compliance to Nigeria’s Anti-Money Laundering and Combating the Financing of Terrorism. The source, who pleaded anonymity because he was not authorised by the government to speak on the issue yet, said, “The French Government has reached out to us over the IPOB matter. It said we should give it account details and any other evidence showing that France was where the majority of the money was coming from. “So, the government has accepted that challenge and we will be instructing the NFIU, SCUML and the CBN to hand over all the details of IPOB’s funding to us in one comprehensive report which will be submitted to the French Government. According to the government other countries from which IPOB also received huge cash inflows include: Turkey, Senegal, Malaysia, Hong Kong, United Kingdom and the United States. The operative said reports would also be given to the aforementioned countries. He added, “Before his arrest, Nnamdi Kanu had appealed to people of Igbo extraction in some of these countries to provide him with funds which would be used in buying weapons and bringing down the Nigerian Government. “In a video, which has even gone viral on Youtube, Kanu said he needed guns. This is not hearsay. In a related development, the Federal Government has said that sponsors of the proscribed IPOB are now afraid. It also said it had evidence that those sponsoring the organisation were those undergoing investigation or those that were politically disgruntled, but that it would not give out their names. Mohammed stated this in an interview with our correspondent in Abuja on Friday. He said that discerning Nigerians would know those behind the funding of the organisation. The minister had earlier accused corrupt and disgruntled politicians of being behind IPOB, adding that the plan of the sponsors was to return to power in 2019 with the intention to continue with the looting of the treasury. However, the main opposition party, the Peoples Democratic Party, replied the minister and asked the government to name the sponsors. But Mohammed said the claim by the PDP was not true, adding that only the guilty were afraid. He said, “Only the guilty are afraid. We have said it. You don’t need rocket science to know that those who are facing investigations are those who don’t want the government to succeed. The minister added that the government was already handling the issues surrounding the allegations he made against France and the United Kingdom. While he alleged that France was the headquarters of IPOB and where its sponsors were based, he said that Radio Biafra was located in the United Kingdom. Both countries have however denied the minister’s claim. Mohammed said that Nigeria was already handling the issue at the diplomatic level.